Ansonia’s Mariah Troutwine goes in for a basket during a non-league game with Parkway on Saturday. The Panthers won the game, 55-45. 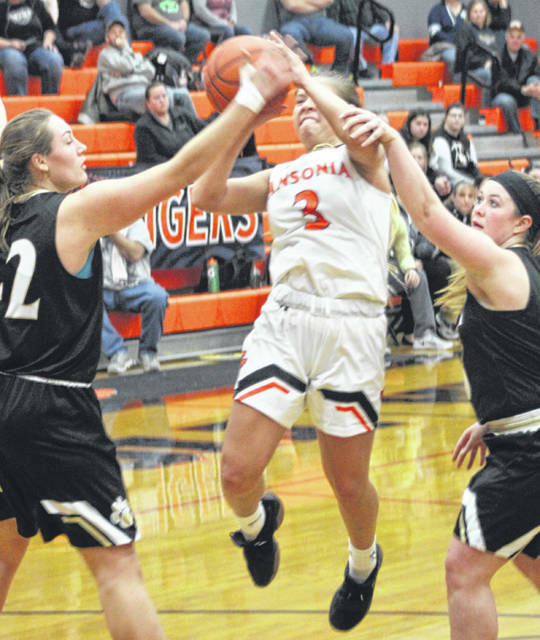 Ansonia’s Trinity Henderson tries to get a shot off between two Parkway defenders during a non-league game on Saturday. The Panthers won the game, 55-45. Ansonia’s Emily Wright drives inside toward the basket during a non-league game with Parkway on Saturday. The Panthers won the game, 55-45. Ansonia’s Heidi Runkel (5) brings the ball up the floor during a non-league game with Parkway on Saturday. The Panthers won the game, 55-45. Ansonia’s Mariah Troutwine (left) and Abigail Powers (12) fight for a loose ball with a Parkway player during a non-league game on Saturday. The Panthers won the game, 55-45. 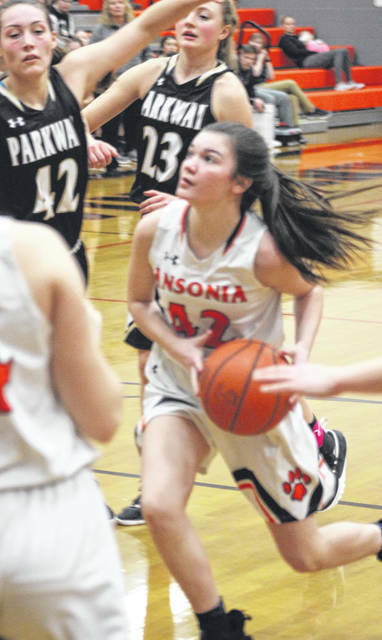 Ansonia’s Mariah Troutwine (2) runs the offense from one side to the other in the half court during a non-league game with Parkway on Saturday. The Panthers won the game, 55-45. 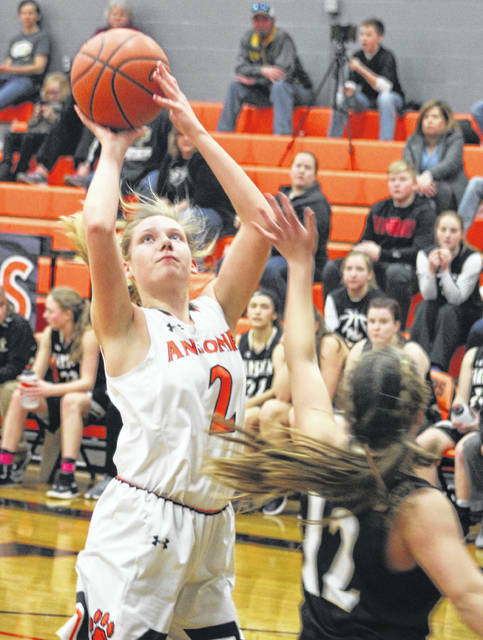 ANSONIA – Despite knowing they were going to be young this season, Ansonia girls coach Jim Bolin had high hopes back in November. Unfortunately, the wins have not come as abundantly as desired and Tigers dropped another one on Saturday to visiting Parkway, 55-45. 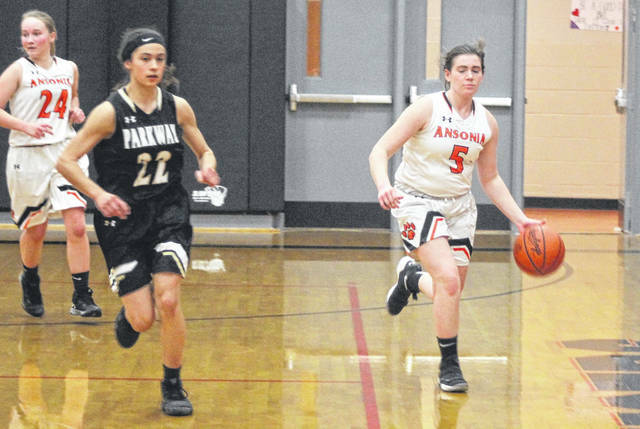 Ansonia was within single digits of the Panthers for most of the first three quarters, but down the final eight minutes Parkway pulled away for the victory. Trinity Henderson led Ansonia with a game-high 23 points. 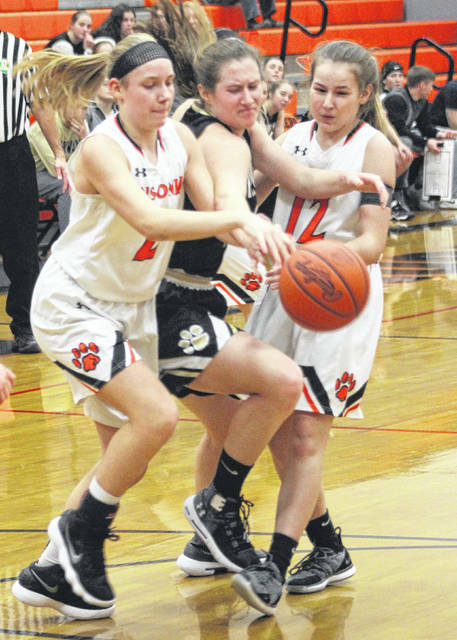 She had five 3-pointers and Mariah Troutwine connected on three long balls for all of her 9 points in the game, but what the Tigers were able to do from beyond the arc, they could not match inside the paint as Parkway poured in 17 deuces compared to 7 for Ansonia. At 5-foot-9, Claire Eichler was a big presence in the paint for Parkway. She finished the game with 13 points, second only to Leah Harshman’s team-high 14 points. Also establishing presence inside for the Panthers was 5-10 senior Stephanie Schaaf, who totaled 8 points. 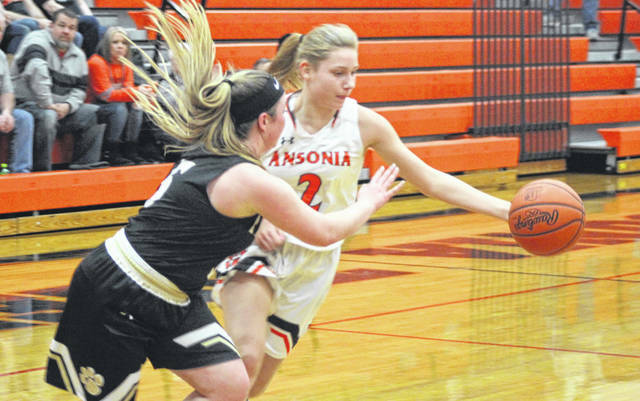 Ansonia has three games left this week before the tournament. They play at Covington on Monday, at Twin Valley South on Thursday and then close the regular season at home against Riverside on Saturday. Parkway – Stephanie Schaaf 4 0 8, Shaelyn Thomas 1 0 2, Kristine Kirby 2 0 4, Clara Hellwarth 2 1 5, Rachel Barrett 1 0 2, Elise Darrigan 2 0 6, Leah Harshman 5 3 14, Claire Eichler 4 5 13. Totals: 21 9 55. Ansonia – Trinity Henderson 7 4 23, Heidi Runkel 1 2 4, Kierra Reichert 2 1 5, Mariah Troutwine 3 0 9, Emily Wright 1 0 2, Emma Barga 1 0 2. Totals: 15 7 45. 3-pointers – Parkway 4 (Darrigan 2, Thomas, Harshman), Ansonia 8 (Henderson 5, Troutwine 3). Records: Parkway (3-14), Ansonia (2-17).